Add a touch of class and elegance to your special occasions with our Brand New Chrysler 300c limousine (Black). Our fabulous Chrysler limo is equipped with a range of special features including jet doors all brought to you by Exoticar the number one limousine hire company in Melbourne. 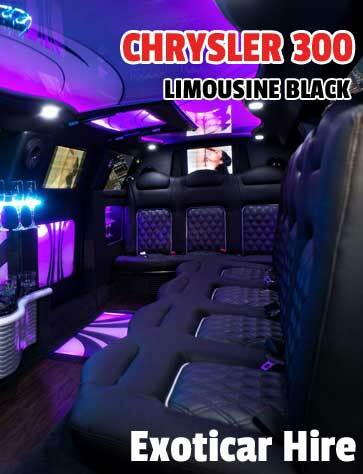 Now make your specialist occasion more special with our Chrysler 300 limousine(Black). Its black color shows the vision of royalty and sophistication. Its elegance looks becomes a preferred option for many people, who want to make their ride luxurious and comfortable. Chrysler 300 limousine (Black) serves you everything that you expect from a luxury vehicle. Comfortable leather seats, open bar counter and expensive music systems make your journey memorable. We also provide you the driver partition So your privacy will not disturb. Our designer’s multimedia LCD touch screen design is the most innovative feature. If it is your wedding day, then Chrysler 300 limousine (Black) will give you a royal touch and make you feel special. It is the best way to make an entrance in Chrysler 300 limousine (Black) to your wedding destination. At the time, when you entered in the vehicle, you will be surprised by its tremendous looks and feels.